Tourism Ireland has won the Grand Prix at the Kinsale Shark Awards for the second year in a row, following on from the Doors of Thrones campaign to the Game of Thrones Tapestry. After seven years of production, Game of Thrones® has truly become a part of Northern Ireland’s heritage and culture. In order to celebrate this, Tourism Ireland have created the Northern Ireland Game of Thrones® Tapestry – a giant, 77 metre long medieval wall-hanging that brings to life the events, locations and story of the most popular television series of all time. 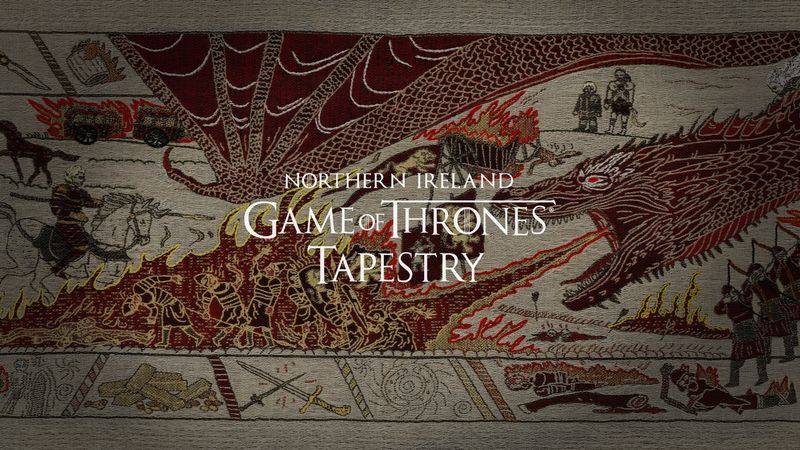 Harking back to Northern Ireland’s rich heritage of textile and linen manufacture, the Northern Ireland Game of Thrones® Tapestry was hand-woven and hand-embroidered using linen sourced from one of the last surviving linen mills in Northern Ireland. Traditional medieval tapestries of a similar size have taken upwards of 20 years to complete. 66 metres of this tapestry were created in under 3 months, to be followed by a new section every week, following the release of each new episode of Game of Thrones® season 7. The full Northern Ireland Game of Thrones® Tapestry is currently on display at the Ulster Museum in Belfast, as well as online at Ireland.com. As season 7 unfolded, new sections of the tapestry were revealed each week, using a mix of cinemagraphs, time-lapse videos of the weaving process, carousels and Instagram Stories. Each element of the campaign drives fans to an interactive “Northern Ireland Game of Thrones Tapestry” web app that allows fans to zoom in and explore the tapestry in full and share their favourite scenes with their friends via social media. The website also reveals the shows filming locations in Northern Ireland, and links to build an itinerary for their own trip. Before being woven and embroidered, each key scene and character from the show has to be painstakingly recreated and designed by artists and illustrators – condensing over 77 hours worth of storytelling into 77 metres of drawings. Once the hand illustrations are complete, designers recreate the drawings digitally, in order to map out the weaving guide and colour pallets befitting each individual scene. These are then hand-woven and brought to life by expert weavers, on a state-of-the-art Jacquard Loom. Each section of the tapestry comprises of Northern Irish linen, as well as the same fabrics and textiles used for the costumes and sets in the show. Once woven, hand-embroiderers then meticulously retouch every fine detail – from King Joffrey’s golden crown to Daenery’s shimmering hair. The Game of Thrones Tapestry project was developed at Publicis London by executive creative director Dave Monk, creative director Dave Sullivan, copywriter/art director Josh Norbury, designer Duncan Rogers, account director Ben McKee, account manager Kathryn Mason, strategist Chris Turner, social media planner Radd Nadesananthan, business director Katie Edwards, agency producer Kal Parmar, working with Tourism Ireland head of marketing communication Brian Twomey, central marketing director Mark Henry. Textiles production was done at Dash+Miller. Digital media was designed at Hugo & Cat. Media was handle at Carat London.